Eligibility for Ayushman Bharat Yojana – How to check PMJAY online? 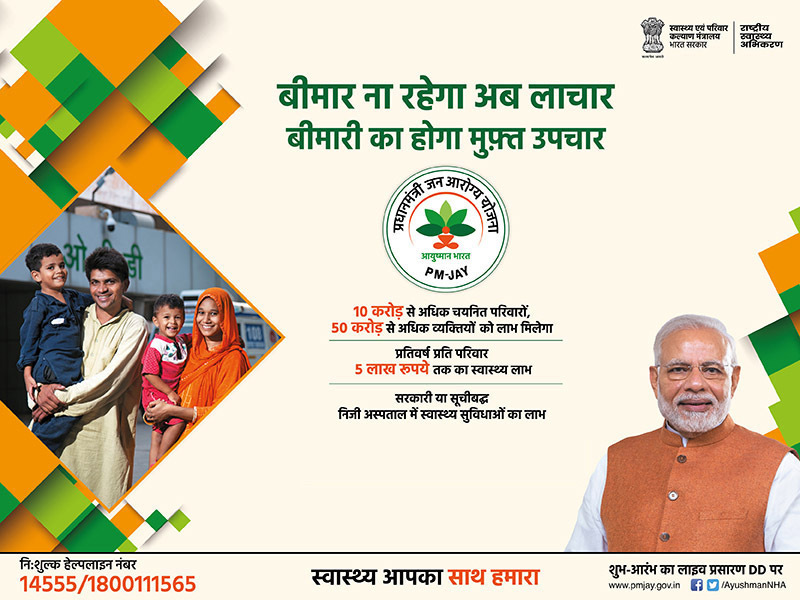 The Indian Prime Minister Narendra Modi has announced the Health Insurance Scheme that is Ayushman Bharat PM Jan Arogya Yojana. As per National Heath Protection Scheme, Aims to provide cashless treatment to patients, provide health insurance coverage of up to 5 lakh rupees per family per year and will cover more then 10 crore poor and vulnerable families. To get the benefits of Ayushman Bharat PMJAY, You must want to eligible for this Health Insurance Scheme. ‘Ayushman Bharat’ PM Jan Arogya scheme uses the deprivation conditions in Socio Economic & Caste Census as for eligibility criteria. In rural areas, there are six deprivation criteria and In urban areas, the households must belong to one of the eleven (11) listed occupational categories. On the Official website of Ayushman Bharat National Heath Protection Scheme, there is an option available to check the eligibility of the candidate for this scheme. If You want to check your eligibility for Ayushman Bharat National Heath Protection Scheme then follow the procedure. Now Click on the option "Am I Eligible"
Now enter an active mobile number (to receive an OTP) and enter the Captcha letters displaying on the screen and click on the “Generate OTP” button. After This, candidates will receive an OTP on the mobile. Enter OTP and click on “Verify OTP”. Here, candidates can check their eligibility by entering a) Mobile number/Ration Card Number (collected during ADCD drive), b) SECC Name or c) RSBY URN. a) Mobile number/Ration Card Number: An Additional Data Collection Drive (ADCD) was conducted at Gram Sabha’s to capture active mobile number and ration card number of a family of the Socio-Economic Caste Census (SECC) database. If Mobile number or Ration card number captured during this drive, then results show. If details captured during the ADCD drive and still no results are displayed, then the “SECC Name” option should be used for searching. b) SECC Name: An individual can search by Name, Father’s Name, Gender, State etc. if no results are displayed, then the user should contact a nearby Ayushmaan Mitra. c) RSBY URN: Additionally, all active families that are enrolled under RSBY (till 31st March, 2018) that do not feature in the targeted groups as per SECC data will be included as well and can identify if they are eligible for PMJAY using RSBY URN. If the search is successful, the individual has an option to receive a text message with the HHID number/RSBY URN for future purposes on his/her phone by clicking the “Get SMS” button and entering the mobile number. If your name is there in the list, it will show on the right side of the page. Click on “Family Members” tab to view the beneficiary details and information of the family members covered under the scheme.